About the book: power the summa of one of the greatest minds in management theory, this book shows readers how to succeed and wield power in the real world. After decades of consulting with corporations and teaching mba students about organizational power, jeffrey pfeffer has seen the pitfalls to which so many people succumb. The problem: they dont have a realistic understanding of what makes some people more successful than others. They subscribe to the "just world phenomenon," believing that life is fair, rendering them unprepared for the challenges and scrutiny of life in the real world. This book brims with counterintuitive advice and surprising research. 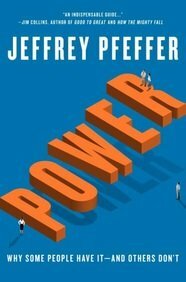 What pfeffer emphasizes in this book, and what he teaches those with whom he consults and instructs in the classroom, is that the pursuit of power is not machiavellian or sinister-but noble and good. Powers a force that can be used and harnessed for individual gain, but also for the benefit of individual organizations and society. Extending this counterintuitive approach, pfeffer also explores how you cant learn about power from those in charge. Their advice tends to put a rosy spin on their ascent and focuses on what should have worked, rather than what did. Based on these observations and many others, power is an organizational survival manual, and a book that should set a new standard in the leadership and management category. Last year pfeffer was named as one of the top ten management gurus in the country by the wall street journal. He has consulted for countless multi-national organizations and corporations and is one of the leading business school professors in the country. About the author: jeffrey pfeffer jeffrey pfeffer is the thomas d. Dee ii professor of organizational behavior at the graduate school of business, stanford university, where he has taught since 1979.